Robin Watts, Linde, Germany, highlights how membrane technology is being used to enhance productivity. For decades, energised fluids containing carbon dioxide (CO2), in various formulations, have been used successfully in hydraulic fracturing and individual well soak treatments known as a Huff’n Puff (HNP) to boost hydrocarbon recovery. But although energised fluids undoubtedly improve recovery, they carry with them the potential to also initially increase the amount of CO2 contained in the early flowback natural gas. 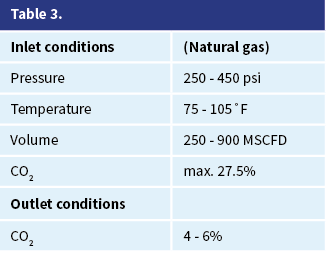 When this occurs to the point that CO2 concentrations exceed natural gas sales pipeline specifications, the most common practice is to flare off the gas until the concentration of CO2 within the gas reduces to acceptable levels. With the onset of the shale gas revolution about a decade ago, well economics placed a greater emphasis on the critical aspect of initial production to maximise favourable economic returns and reduce the impact of potential dramatic production decline over time –as much as 75% in the first year for shale wells. Around the same time, the U.S. Environmental Protection Agency (EPA) began seeking to reduce emissions of both methane and volatile organic compounds (VOCs) from oil and gas production fields. The agency began to identify best practices through its Natural Gas STAR Partners Programme – a flexible, voluntary partnership that encourages oil and natural gas companies, both in the US and internationally, to adopt cost-effective technologies and practices that improve operational efficiency and reduce emissions of methane. This effort resulted in new regulations aimed at reducing emissions of VOCs and methane from hydraulically fractured gas wells, including the first air standards for those wells, and subsequent regulations for Greenhouse Gas Reporting requirements as well as Reduced Emissions Completions (RECs) – also known as ‘reduced flaring’ or ‘green completions’. The stated goal was not only to reduce VOCs by 95%, but to also recover 90% of saleable natural gas. Although implementation of these new regulations was originally set to begin in 2012, actual full implementation was delayed until January, 2015 as it was recognised that not enough REC equipment existed and additional time was needed for it to become readily available. The Centre for Sustainable Shale Development (CSSD), which focuses on shale development in the Appalachian Basin, however, did manage to establish similar standards for RECs and Green Completions at an earlier effective date of 1 January, 2014. As always, the biggest challenge for natural gas producers became finding ways to improve well economics while complying with EPA standards. In it most basic form, reducing methane emissions during well completions and stimulations is undertaken with flaring. However, methane, VOC and other hazardous air pollutant (HAP) emissions can be reduced significantly further to the RECs standards and can also eliminate or significantly reduce the need for flaring. The method includes bringing portable equipment on site to separate the gas from the solids and liquids produced during the high-rate gas flowback, and produce gas that can be delivered into the sales pipeline. REC equipment such as sand traps, plug catchers and separators allow for the capture and recovery of natural gas and condensate. The states of Wyoming and Colorado were the first to implement ‘flareless completions’ regulations requiring such equipment. The EPA, learning from their Natural Gas STAR Partners, published a summary on the partners’ successes with economical RECs, including when energised fracturing with CO2 or N2 was undertaken. The economics evaluated included a purchased or contracted service of REC with a daily incremental charge of US$700 - US$6500/d over a three to ten day period. Removal of excess CO2 was accomplished utilising a membrane separation unit where the CO2-rich permeate was vented with the recovered hydrocarbons sent to the sales line. The unit was used on ten wells with an average cost per well of US$32 500. The operator reported a net profit of an average of US$34 000 per well. 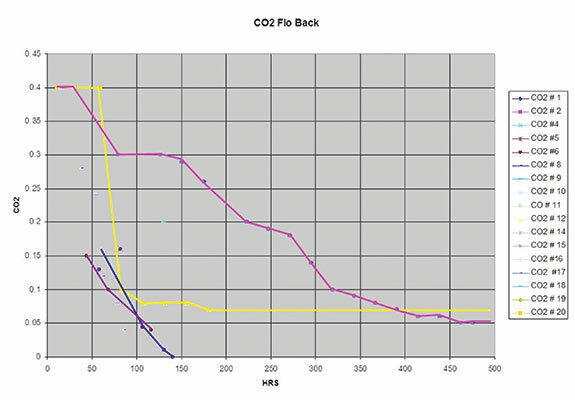 Figure 1.CO2 concentrations during well flowback over time. Depending upon the flow rates of natural gas and the concentration of CO2 in the stream, amine or membrane systems can be used to scrub out excess CO2. Natural gas processing plants, which have high throughput volumes, typically use an amine system to scrub CO2. Gathering systems, which collect the flow from multiple wells, can potentially also process higher volumes and higher concentrations cost-effectively using an amine system. Figure 2. General operating windows for amine and membrane methods scrubbing of CO2 from natural gas. Not only is the ability to scrub CO2 under varying inlet concentrations and conditions necessary, the operational costs of such a system needed to be such that an operator can make money during early flowback. The unit needs to more than pay for itself with gas prices under US$3/thousand ft3 and with the lowest possible volumetric flow rates. 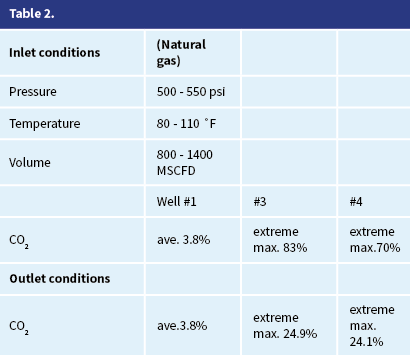 Membrane technologies typically deployed for natural gas applications have had limitations, such as the need for extensive pre-treatment of membranes, the need to heat membranes during operations, the need to replace them in the event of chemical fouling, no capability for C3+ hydrocarbon recovery and then the need for re-compression to enable acceptable recoveries. All of these had potential for negatively impacting the cost-effectiveness during the early flowback scenarios. At the time the new EPA regulations were announced, operators’ options with regards to supply and operation of membrane technologies were limited. They could either develop their own membrane system or use the services of a sole provider who may only have had a single membrane unit – and which, at the time, required flow volumes greater than 4 million ft3/d in order for the operator to break-even. Or they could flare. It was evident that a more cost-effective method was needed in order to support completions programmes that used CO2. However, any new system would need to meet a multitude of both operator and EPA requirements. Firstly, it would be necessary to ensure the operator could be profitable even during relatively short operational windows, at low natural gas prices – even at less than US$3000 ft3 – and across lower process volumes (including associated gas rates from oil wells). Recovery of methane and higher hydrocarbons from CO2 scrubbing of natural gas would need to meet EPA emissions standards and natural gas would have to meet CO2 pipeline specifications. Mobility and easy deployment would be another key factor, suitable for rugged environments, but still able to meet applicable department of transport standards and codes. Figure 3. Simulated membrane recovery rates) and well results. The unit itself is on a trailer mounted skid with a series of safety features to ensure safe, remote operations. It can be operational within half a day depending on location logistics. The unit also can be shutdown, purged and driven to the next location very quickly. Since natural gas production is already being sent directly to the gathering lines, and the MGCU system is being bypassed, there is no need to isolate the well. Since membranes themselves are not new to gas processing, the key elements for performance testing of the new system were to determine if the membranes performed according to specifications of pressure, volume, and varying inlet CO2 concentrations. Three field trials were run under various operating conditions. The following is a summary of each of those trials. After one week soak, to scrub CO2 from associated natural gas during production and test membranes under very low pressure and low flow conditions. Membranes scrubbed CO2 better than expected for such low inlet pressures. To scrub CO2 from early flowback natural gas to a target of 10% or less by concentration, deliver well clean-up to pipeline specification in typically less than 24 hours and test membranes under extreme conditions of very high CO2 concentrations. Figure 4. Trend line of CO2 inlet and outlet conditions for MGCU on natural gas well #1 in Rockies. The first well clean-up was faster than anticipated. 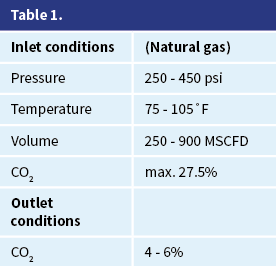 Figure 4 shows the trend line of the CO2 inlet and outlet conditions. The trial continued in two other wells – both under maximum CO2 inlet concentrations – well above the recommended 50% or less. The membranes scrubbed the CO2 better than expected bearing in mind the extreme inlet conditions of CO2 concentrations while at pressures lower than designed for ideal operations. Figure 5. Inlet CO2 concentrations for natural gas well in South Texas. It took approximately one month for well to clean-up to targeted 8% CO2 concentrations. Under lower than specified pressures and varying flow volumes, the MGCU met the targeted clean-up level. The well took approximately one month to clean-up on its own below the specified target of 8% (Figure 5). The MGCU remained deployed and operational with minimal oversight during that one month period. The MGCU membranes surpassed expectations with respect to CO2 scrubbing, even at lower than specified inlet pressures, in the initial test on associated gas from an oil well soaked after CO2 HNP stimulation. 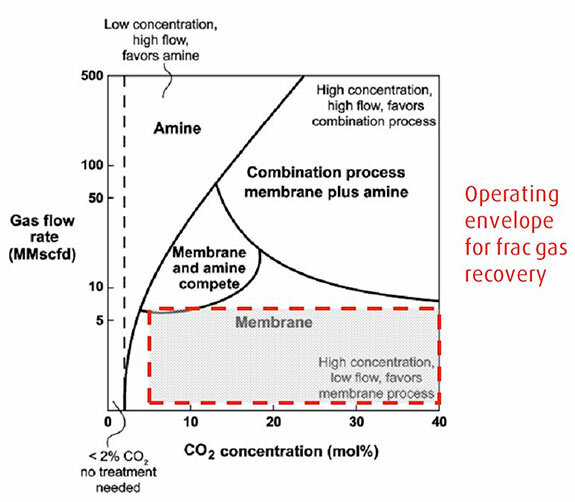 In the second trial, the membranes were subjected to increased stress by allowing very high inlet concentrations of CO2 – beyond designed maximum specification – along with lower than optimal inlet operating pressures. Once again, the membranes performed better than expected. In the third trial, even for extended deployment in remote conditions, the unit membranes continued to exceed performance expectations, even at less than optimal inlet pressure conditions. The new MGCU enables oil and gas operators to most economically monetise early flowback gas by scrubbing out CO2 to meet pipeline specifications while minimising flaring and greenhouse gas emissions. Its design flexibility results in operator lease charges based on length of use and volume of flow. Depending on location and costs associated with the mobilisation and demobilisation of the unit, an operator can experience break-even operating costs well below the maximum volumes the unit can process. Edited from an article by Robin Watts, Linde.